"My friend Cannon," said Jacobus Parker one day, "like myself, has had a remarkable career. But he enjoys a fine property in the crossing he sweeps, and in 'wall working.' With the latter I help him as much as I can, as he has fallen into poor health lately. I exact a trifle by way of payment for my aid, quite as much on his account as on my own. It enables him to feel happier and more independent. One of the most pleasing phases of the life of the poor is found in the sacrifices they make to help each other in times of trouble. In the case under notice, the service offered and gladly accepted by Cannon was all the more grateful as it was not absolutely gratuitous. The recompense rendered for the timely help was in itself so inadequate-sixpence a week - as to leave no doubt that it was the mere subterfuge of a kind-hearted, sympathetic friend. Cannon, who is pictured seated on the right of the accompanying group, was the son of a boot and shoemaker. He served his apprenticeship to the trade, and afterwards worked for some years as a journeyman, in the days when boots and shoes were solely made by hand. At last, with a capital of ten shillings, he started on his own account. With this amount he bought material sufficient for a dozen pairs of children's shoes. His wife bound the shoes, and he spent his days and nights in finishing them for the market. The energy and perseverance of the young couple was rewarded by an influx of large orders, and by the accommodation secured in opening credit accounts with the dealers in raw material. The smallest pieces cut from the leather of walking shoes were carefully reserved and manufactured into slippers. Twenty-four shillings was the price received per dozen for children's morocco boots-a price which yielded a good return for the labour bestowed. "In those days," said Cannon, "money came freely, and, alas! was spent as freely as it came." Large sums passed through his hands and always left a satisfactory profit behind, amounting to as much as a shilling per pair on the small morocco boots. Cannon, having borrowed ten pounds from a friend, proceeded to extend his operations by employing labour and devoting his own time to the working of the business. At this stage of his career he experienced no difficulty in obtaining twenty or thirty pounds' worth of material on credit; but a portion of the goods manufactured had to be mortgaged to the merchant who supplied the material. Cannon accounted himself a prosperous man. His business was flourishing, and he had a reserve fund of about fifty pounds to his credit in the bank. But with fatal fatuity, instead of jealously guarding this reserve, it was now and again taxed to meet the cost of a day spent in luxurious, and withal, hardly-earned ease. The hour of reckoning soon came, when all his energy and resources were put to the test. 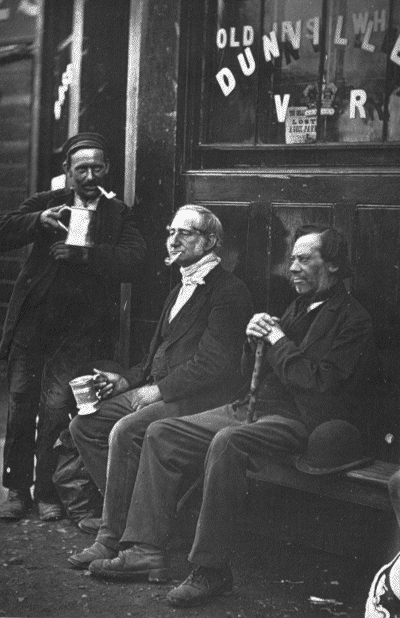 The outbreak of the Crimean War brought many unforeseen troubles upon men who had no active share in the conflict. It fell heavily on Cannon in his peaceful pursuit of boot and shoemaking for children. He had, at the time, about thirty outdoor workers in his employment. Some of his most expert hands, men "who could make a shoe a'most when lookin' at em," were seized with the war fever and enlisted. "In fact, sir," said Cannon, "good men were not to be had for love or money; and, worst of all, leather rose awful-out o' my reach. It mounted up as high as a shilling per pound on the old price. I could not get the same article for ten sovereigns that used to fetch five. Men's wages, and duffers they was that demanded them, rose one-half. Fellows no good either for sodgerin' or shoemakin' got more good money than I could spare for bad work. What little I had by me melted off' like snow in summer. As the war went on, these even enlisted-one decoyed another away. The advance in the price of the finished article didn't half cover the increased cost in makin'. I was willin' to work, God knows! but it was like sittin' up a straw to stem the tide. It was all too strong for me. I lost my footin' and drifted down. I had no man to lend me a helpin' hand. I was fairly knocked over, and when a man's fairly over, he begins to find out his friends. I found none. When the men returned from the war, they wanted to come back to me, for I had dealt fair with em; but I was broke, and could not take em on. I gave up everything; was sold up-every stick of furniture went - and, with the odds and ends of my home I had gathered about me, went my heart-my pluck! I sickened, and having no bed-nothin' ! - I drifted into the workhouse. I lay there for three months, and feelin' stronger one day, I got up, went out, and was restin' again the rails at Kennington Church. There, sir, a gentleman came to me, and, says he, You look very hard up, my friend. 'You never spoke a truer word,' says I. 'Well,' he went on, 'the man's dead that swept this crossing. If you're not above the job, will you accept a new broom and set to work.' I took the broom, and it put new life in me. The first afternoon I earned three-halfpence. Next day I got sevenpence halfpenny. My new friend advised me to follow it up. I did so; and after a bit made a shilling, and at times one-and-threepence a day. When I got known, I managed to pick up my food from day to day. I got to be trusted too, with parcels, letters, and such like; but now the trains and busses have took that from me, and it's next to nothin' I make that way. "My health was too bad to allow me to go back to my old trade, and I had no knowledge of the new machinery they was took to usin. My missus had to go out washin' and such like, and used to earn about a shilling a day. I was ill then, but I'm a deal worse now. I thought nothin' of hardships when I could go about; but bronchitis, or asthma, brought me so low at times, - no tongue can tell the misery I suffered. I have to give up the broom, and carpet-beating, so that my only stand-by is the 'wall working.' My old friend Parker gives me a hand to mind the boards." The wall working or fence working, described by Parker as a fine property, is a system of cheap advertising. Where a portion of a wall or fence, near some public thoroughfare, can be rented or obtained gratuitously, it is covered with an array of boards, which arc hung up in the morning and taken in at night. In this instance, the boards covered with thin hills are supplied to Cannon, who hangs them up in the morning and receives about a shilling weekly for each board. But the number of boards afford no clue to the income derived from this mode of advertising. as an indefinite number of dummies are displayed to fill up vacant spaces. The dummies are carefully selected; the advertisements they carry must be as imposing as the names of their owners are respectable. Cannon assured me that it required tact and experience to manage this sort of property. Unfortunately the dummies have been dominant of late, owing to depression in all departments of trade. The result is that the "wall workers" property produces a return so poor as hardly to repay the pains bestowed on its management. Cannon and his wife occupy a room, or garret, in the neighbourhood. It is almost devoid of furniture, and their bed covering, even in cold weather, consists of a single sheet and the old coat which the husband wears during the day. This aged couple pay a weekly rental of half-a-crown, while the balance of their joint earnings goes "for a crust of bread." "Business, sir? don't talk of business! It's going clean away from us." In the "us" were included collectively the merchants of the British Isles, as will appear evident from the following remarks :- "The country is going down-hill; seventy-five per cent. fall in the trousers of an Englishman means no good. Such articles were all honest wool when I took to collecting; but now flash and flimsy is the style. Steam-dressed goods, cotton and dye and shoddy's all the rage. Long ago it was all fleece and no fleecing. When a gentleman tired of an honest coat, he handed it over to me; I put a new face on it, and it was as good as bran new to a poor man. Now, renovating and reselling at a decent profit is out of the question. It comes of the pride of the working classes, trades' unions, strikes, and such like - and fashion, sir, fashion ! Fashions used to last a lifetime, and coats were worn till their owners tired of them, and they went down the scale respectable to dress the labouring classes. But labourers now ape their masters and buy at first-hand, because they would be gentlemen on their many holidays, when they've left hod and spade to loaf and lark at leisure. My occupation is therefore nigh gone, since I don't buy of the uppermost swells. It's my solemn opinion that things are fast going to the dogs. We live in a flashy age - nothing solid, nothing substantial-all show and tinsel! That's the world from my point of view; and although I am an old-clothes man, I can draw my conclusions from the signs of the times. I can tell a man from his clothes. There's the gentleman that's cut, and fitted, and padded like a man; and there's the ready-made shopman - trousers ten shillings, and all the rest of it. His clothes would not be worth a bid after a fortnight's wear, and he wouldn't sell them until they are only fit for mashing up or manuring a field. I have, of course, my regular customers, but even they are not a patch on what they used to be for profit." If space permitted, I might add many more sharp remarks uttered by the "old clo'" dealer; but, even as it is, I have omitted to give any details concerning the third figure in this group. On some future occasion I may, however, be able to write a brief sketch of this latter character.